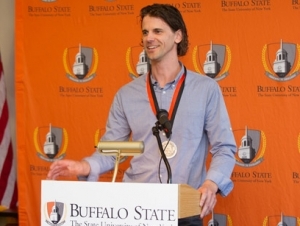 Mark T. Miller, '94, received Buffalo State’s 2014 Young Alumnus Achievement Award in a ceremony held September 25. Miller, a senior scientist at Vertex Pharmaceuticals in San Diego, is a member of the research team that developed Kalydeco, the first prescription medicine to treat an underlying cause of Cystic Fibrosis. He received his bachelor's degree in chemistry from Buffalo State as part of the All College Honors Program (now the Muriel A. Howard Honors Program). As a student, Miller conducted undergraduate research on activated copper with Gregory Ebert, professor of chemistry. Miller went on to earn his Ph.D. from the University of California, San Diego in 1999. He has spent 14 years as a medicinal chemist with a focus on ion channels and transporters. Twelve years of his career at Vertex have been spent on Cystic Fibrosis research. "We are very proud of Mark’s recent accomplishment, and it was wonderful to hear how his undergraduate research at Buffalo State and his mentorship by Buffalo State faculty members were seen as important contributors to his early interest in science and research," President Katherine S. Conway-Turner noted in her blog. During Miller’s visit to his alma mater, he lectured to Buffalo State students on Cystic Fibrosis, medicinal chemistry, and drug development. Additionally, he spoke to undergraduates who might be considering a career in drug discovery, setting an inspirational example. “Mark’s enthusiasm and dedication to his profession are evident to all who meet him, and we were thrilled that he took the time to share his knowledge and experience with our students,” said Mary-Jo Jagord, director of alumni affairs. "We’re very proud that he began his journey at Buffalo State." The Buffalo State Alumni Association established the Young Alumnus Achievement Award in 2002 to recognize outstanding alumni who graduated within the last 20 years. Recipients of the award have achieved significant professional accomplishments, demonstrated service to the community, and shown loyalty to Buffalo State and its mission.